RIEDEL Decanter Black Tie Touch Red R.Q. Home Shop RIEDEL Decanter Black Tie Touch Red R.Q. The handmade decanter distinguishes by an elegant and complex design. RIEDEL whole-heartedly believes all wines - young and old, red, white or sparkling - can be enhanced by decanting. RIEDEL tip: use bottle cleaners to remove stains inside the decanter. RQ = this item is supplied as 'Restaurant Quality' meaning that it may contain small imperfections when compared to the same item in 'best quality' and, as such, is offered at a special purchase price exclusively for use in restaurants. 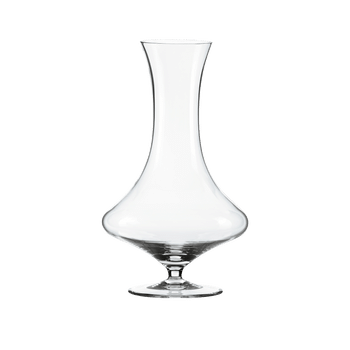 How do I clean my decanter? After use, rinse the decanter thoroughly with warm water until the water runs clear. Do not use soap. No one has drunk from the decanter and alcohol is a natural disinfectant.